The sharp increase in the price and production of quinoa between 1990 and 2014 has had important impacts in Bolivia’s southern Altiplano region, previously considered one of the poorest regions in the country. The socio-economic status of most inhabitants improved significantly as a result of the “quinoa boom”. However, it also caused severe disturbances in socio-ecological systems and posed challenges to resource governance by traditional indigenous institutions. This article focuses on the role of farmer cooperatives, in particular, and examines how their production rules may have mitigated some of the challenges associated with the quinoa boom. We assess the activities of cooperatives with the help of Elinor Ostrom’s Institutional Analysis and Development (IAD) framework and analytic tools such as the ADICO grammar (Attribute, Deontic, aIm, Condition, Or else) and the eight design principles. The key production rules of cooperatives are examined and compliance with these rules is estimated based on semi-structured interviews and a survey conducted with quinoa producers (n=305). We argue that the cooperatives successfully contributed to alleviate pressures on resources in a context where traditional authorities were challenged by new tasks associated with land grabbing and the crowding out of diversified agricultural activities. In conclusion, we argue that collaboration between traditional authorities and farmer cooperatives holds great potential for improving the governance and sustainability of socio-ecological systems in the region. In recent decades, agrarian systems worldwide have undergone important changes, including the rise of dominant corporate-led agro-industrial food regimes (Bernstein 2015) and a corresponding redefinition of farmers’ and peasants’ identities and livelihoods (Harriss 1982; Chatterjee 2008; van der Ploeg 2008). These developments have significantly increased pressure on natural resources. Quinoa, a pseudo-cereal and traditional staple food of Andean indigenous populations, epitomizes these trends. In recent years, quinoa has evolved from being a neglected traditional food to an important export crop, promoted as a “superfood” throughout the Western world (Nuñez de Arco 2015; Bazile et al. 2016). Rising demand among Western consumers has created new economic opportunities for quinoa farmers in Bolivia’s southern Altiplano (Laguna 2000; Kerssen 2015; Tschopp 2018). However, the steep rise in quinoa prices has also created new challenges in terms of environmental degradation, for example, manifesting as pesticide contamination or drastic land use change from extensively used pastures to intensively used agricultural land (Jacobsen 2011; Orsag et al. 2013; Walsh-Dilley 2013; Winkel et al. 2016). Recent research suggests that institutional interplay between traditional Common Pool Resource (CPR) systems in the southern Altiplano, on the one hand, and self-organization systems, on the other, could be key to the realization of socio-economic benefits from rising quinoa prices, while mitigating possible negative environmental impacts (Winkel et al. 2016). Given the economic importance of quinoa in the region, quinoa cooperatives and their production rules are an important element of the relevant CPR system. Affiliation with a quinoa cooperative enables quinoa producers to obtain access to the high-price markets of organic and fair trade certified quinoa. To date, there has been little research on the quinoa boom’s effect on the dynamics of institutions governing the use of land. Thus, the present article seeks to examine institutional governance dynamics and related socio-economic and ecological outcomes triggered by the quinoa boom in the context of local CPR governance. More specifically, we analyse how farmer cooperatives handled compliance with international production standards, and how this changed the dynamics of CPR governance of Tierras Communitarias de Origen (Native Community Lands, TCOs). We also investigate whether and how the resulting institutional transformations helped manage the strongly increased pressure on natural resources. Based on our results, we argue that interaction between traditional CPR institutions and farmer cooperatives resulted in stricter rules for quinoa production and that some of these rules likely mitigated possible negative impacts of the quinoa boom. Expanding on our empirical insights, we discuss cooperatives as an example of bottom-up institution building, framed as “constitutionality” by Haller et al. (2015). The article is structured as follows: In the next section, we present the general context and our region of study. In the third section, we compare different theoretical perspectives to frame our case. In the fourth section, we present our results and analyse six production norms of quinoa cooperatives. In the fifth section, we discuss some of the results in light of Elinor Ostrom’s eight design principles of CPR management and the constitutionality framework. Quinoa production in Bolivia was traditionally concentrated in specific regions, especially the southern Altiplano in the departments of Potosí and Oruro (Figure 1). This area is characterized by very low rainfall – between 150 and 300 millimetres (mm) per year – saline soils, and high sun exposure, as well as frequent occurrence of drought and frost (Geerts et al. 2006; Pouteau et al. 2011). Our specific study area lies in the municipalities of San Pedro de Quemes, Colcha K, and Tomave. These municipalities comprise more than 50 communities distributed over a large geographic area, but feature a population of fewer than 9000 households (see Table 1). We chose these municipalities for the present study because of the expressed willingness of three cooperatives present in the region to participate in the research and because of prior fieldwork conducted in this specific area. Map of the southern Altiplano. Basic demographic information of the study region (Source INE 2012). Quinoa is the only significant cash crop that can be cultivated in this area. Issues of land distribution and use of natural resources must be understood in this context. Access to land and types of permissible land use among families are defined by community norms that are often formulated by the community as a whole during assemblies. These norms are implemented and monitored by various forms of traditional authorities including corregidores (“correction officers”), agentes municipales (“municipal agents”), and kuraka (“mediators”). In some cases, community rules have been developed and formalized with the support of NGOs, such as AVSF (Agronomos y veterinaries sin Frontera; see Argandoña Espinoza 2016). Rules regulating access to land vary according to the type of access and the type of land use. The most important land use types within communities are pasture land for collective use and “privately” used agricultural land. The latter is still community land, but it is reserved for a specific family who is given exclusive use rights (Vassas-Toral and Vieira Pak 2010; Vassas Toral 2011). These rights are usually passed on within families across generations; however, the land in question cannot be granted, sold, or transferred to anyone outside the community (Vieira Pak 2012; Kerssen 2015). Hence, while local pasture land use is consistent with the usual definition of CPR, land use for agricultural production retains features of CPR (common ownership, common use when fallow), but also differs in key ways (privately used on behalf of crop production). The diverse stakeholders shaping land use decisions are presented in Figure 2. While community-level land use decisions are shaped by traditional authorities and cooperatives, these stakeholders are entangled in networks involving actors at the national and international level. In this way, the longstanding traditional authority system has been increasingly caught up in a complex system of governance, faced with challenges from fluctuating quinoa markets. Map of stakeholders influencing land use in the region. Around 2007, a spectacular increase in prices marked the beginning of the quinoa boom. These prices initially stabilized at high levels, even reaching 8000 USD/ton, but began falling by the end of 2014. The quinoa boom further accelerated the mechanization of agricultural production, and prospects for high profits led to conversion of massive amounts of pasture land into land under quinoa cultivation (Vieira pak 2012). While the land conversion phenomenon existed prior to the quinoa boom, it sped up markedly around 2007–2008, together with high prices of quinoa on international markets (Winkel et al. 2012; Orsag et al. 2013; Kerssen 2015). The increasing conversion of pasture land led to a significant decline in CPR, especially pasture areas. In some communities, this decline had dramatic effects, causing agricultural producers to abandon livestock keeping because of the lack of decent land for pasturing. Other socio-ecological consequences of the quinoa boom included further degradation of CPR due to erosion and pesticide contamination. As such, the quinoa boom gave rise to major challenges for the region and significantly increased pressure on land. The precise socio-ecological impacts of the quinoa boom are difficult to assess accurately and comprehensively (Vieira Pak 2012; Winkel et al. 2012). We have chosen to focus on land conversion from pasture to agriculture – which is a strong indicator of socio-ecological systems reaching their production limits (Winkel et al. 2016) – and to examine how cooperatives may have helped mitigate negative impacts. Cooperatives1 have been particularly important in the development of the quinoa market, first by arranging quinoa exports to Peru and then to North America and Europe from the 1980s to today. These cooperatives also introduced various rules on quinoa production, mainly relating to “fair trade” and “organic” certification of quinoa exports, although not exclusively. Further, they developed monitoring mechanisms and independent controls to ensure that farmers would respect the rules even when market prices might tempt them to do otherwise (e.g. use of pesticides in case of pest infestation, side-selling, etc.). Hence, the cooperative model differs significantly from the other types of commercial farming in the sense that they are not only interested in economic profits, but also have social and environmental objectives. Instead of seeing a contradiction between profit and social goals, Fairbarn (2003) further defines the specific dual nature of cooperatives through relationships and linkages between a cooperative and its members. Fairbairn (2003) argues that cooperatives socially link members to one another, link the resulting group to shared economic and environmental goals, and enable adaptation to specific markets. The first quinoa cooperatives emerged in Bolivia as early as 1975 with the creation of the Central de Cooperativas Agropecuarias Operación Tierra (CECAOT). This organization was originally assembled around mechanization of agriculture and sought to regroup producers to manage and buy important assets such as tractors (Laguna 2003). Today, however, these cooperatives mostly manage collection and transportation of quinoa from different communities, sale of the product to national and international buyers, as well as enforcement of the same set of production rules among all members. Each of these organisations counts between 200 and 500 members. They represent an important share of the quinoa producers in some local communities – as much as 80–90% in remote communities such as Copacabana (Nor Lipez), but much less in other communities, especially those affected by post-boom migrations. Producers who do not belong to a cooperative either sell their quinoa to local intermediaries or are affiliated with individual private firms that export quinoa on their own, sometimes also under organic labels. The leaders of farmer cooperatives typically claim that they uphold higher production standards, are less involved in agricultural expansion and offer producers better prices than investor-owned quinoa operations. Understanding of natural resource governance took a major step forward with the ground-breaking work of Elinor Ostrom and others (Ostrom 1990; Dietz et al. 2003), who emphasized the importance of the local level in natural resource governance. They demonstrated that local institutional mechanisms hold greater potential in terms of efficacy and sustainability when compared with centralized governance of natural resources (Berkes 2008). Ostrom’s approach led to the creation of the Institutional Analysis and Development (IAD) framework (Ostrom 1990; Polski and Ostrom 1999; Ostrom 2009). In this framework, actors operate within the boundaries of an “action arena” defined by the biophysical world, community settings, as well as the rules in use. At the same time, institutions are conceptualized as boundaries or incentives that shape human initiatives, actions, and their outcomes (Haller 2007). Ostrom was particularly interested in the conditions that could contribute to the failure or success of local institutions in governing natural resources. Her work led to the formulation of eight key conditions under which CPR could be managed sustainability (see Table 2). These principles have frequently been used in the literature on natural resource governance to assess the effectiveness and ability of an institutional system to govern natural resources sustainably (Cox 2011; Forsyth and Johnson 2014). More recent work tried to extend these principles to other fields (Wilson et al. 2013). Nevertheless, application of these principles can be difficult, in particular when boundaries do not fit well with Ostrom’s definition (Turner 1999; Quinn et al. 2007), or when multiple centres of power exist. This latter situation, reflecting the concept of polycentricity (Ostrom 2010; Nagendra and Ostrom 2012), corresponds rather well to the situation in our study region. Traditional authorities in the area acquired important powers following their recognition by the Bolivian state (Laguna 2011). 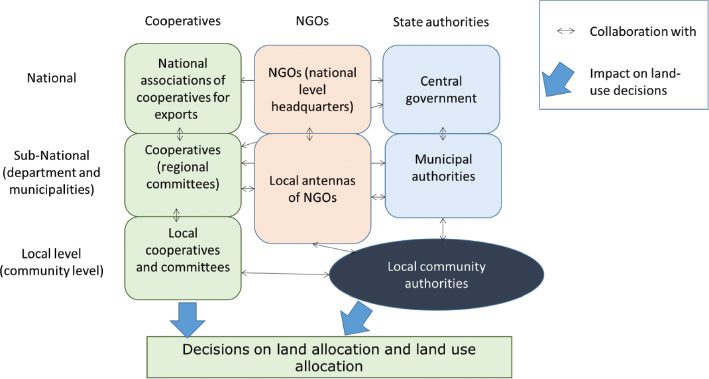 At the same time, the traditional authorities coexist alongside NGOs, state authorities and cooperatives – and all of these actors participate in shaping collective land use decisions in the region (Winkel et al. 2016). The roles of these actors will be addressed in greater detail in the next section. In particular, we focus on how these actors were affected by an exogenous shock, namely, the quinoa boom. A review conducted by Cox et al. (2010) concluded that the eight design principles are largely supported by the existing literature on CPR; they proposed a modified version of the principles that specifies their use and identifies several specific sub-conditions. We have opted to use the revised version of the principles in our analysis. Design principles for community-based natural resource management (adapted from Ostrom 1990; Haller 2007; Cox et al. 2010). The boundaries of the resource system as well as the individuals or households with rights to harvest resource products are clearly defined. 1A: Individuals or households who have rights to withdraw resource units from the common-pool resource (CPR) must be clearly defined. 2A: Clearly defined boundaries: The boundaries of the CPR must be well defined. Rules specifying the amount of resources that a user is allocated are related to local conditions and to rules requiring labour, material, and/or money. 2A: Congruence between appropriation and provision rules and local conditions: Appropriation rules restricting time, place, technology, and/or quantity of resource units are related to local conditions. 2B: The benefits obtained by users of a CPR, as determined by appropriation rules, are proportional to the amount of inputs required in the form of labour, material, or money, as determined by provision rules. Most individuals affected by the appropriation rules can participate in modifying the operational rules. Monitors who actively audit CPR conditions and appropriator behaviour are responsible for the conduct of the members of the system. 4A: Monitoring: Monitors are present and actively audit CPR conditions and appropriator behaviour. 4B: Monitoring: Monitors are accountable to or are the appropriators. Appropriators who violate rules are likely to be assessed graduated sanctions (depending on the context of the offense). Appropriators and their officials have rapid access to low-cost local arenas to resolve conflicts between appropriators and/or between appropriators and their officials. The right of members to devise their own institutions are not challenged by any external authority. Appropriation, provision, monitoring, enforcement, conflict resolution, and governance mechanisms are organized in multiple layers of nested enterprises. Nagendra and Ostrom (2012) emphasize that flexibility and adaptation of local institutions are usually not sufficiently taken into account in the literature on institutions and change. This observation is echoed by others: Drawing on research by Ensminger (1996) on institutional change, Haller and Merten (2008) stress the importance of the socio-political process through which institutions evolve or are adopted/abandoned by a community (Ensminger 1996). Ensminger focuses on exogenous changes such as market shocks and their effects on local institutions governing CPR and livelihood outcomes in developing countries. According to Ensminger, political, ecological, demographic, and social changes can directly or indirectly affect values of a given resource and hence its “relative price” for local populations (Ensminger 1996; Landolt and Haller 2015). This shift in relative price shapes the incentives of local actors who, in turn, may significantly modify local CPR institutions in response. According to this framework, institutional changes are not linear or automatic phenomena. Instead, Landolt and Haller emphasize that changes are negotiated, with outcomes depending “on actors’ bargaining power and the ideologies they use to legitimize the institutional design” (Landolt and Haller 2015, 101). Ensminger’s approach to institutional change was further developed into the constitutionality approach to explain how local actors can foster the creation of new institutions, or, put differently, can participate in “bottom-up institution-building processes.” (Haller et al. 2015, 68). Haller and colleagues stress that negotiating a new set of rules anchored in local tradition requires specific conditions. While multiple factors are identified, it is important not to overlook strategic actions based on unevenly distributed interests and asymmetric power relations. It is therefore crucial to provide local actors with “a fair platform in a context of different bargaining power constellations” (Haller et al. 2015, 84). The role of the state or other facilitators such as NGOs is hence very important in order to assist the creation of such platforms, and might explain specific cases of success or failure of bottom-up institution-building processes. In this way, constitutionality illuminates how conflicts over resource management lead to formalized compromises with collective benefits for most or even all actors (Knight 1992). For this study, cooperatives’ rules were coded following a format similar to the ADICO grammar proposed by Sue Crawford and Elinor Ostrom (Crawford and Ostrom 1995; Ostrom 2009; Schlüter and Theesfeld 2010). It is a form of content analysis that has been used to analyse and compare multiple sets of rules (Basurto et al. 2009; Siddiki et al. 2011, 2012; Frantz et al. 2013). It makes it possible to distinguish between different types of institutional statements, labelling them as strategies, norms, and rules according to the elements of the grammar used in each case (Basurto et al. 2009). We used this format in order to compare different institutional statements and how they apply to the socio-ecological system. The acronym ADICO refers to five subcomponents that may be applied when analysing an institutional statement: Attribute (A), Deontic (D), aIm (I), Condition (C), and Or else (O). The Attribute (A) is the individual or organization to which the institutional statement applies. The Deontic content (D) refers to the type of modal verb used in the statement. The aIm (I) describes particular actions or outcomes to which the deontic content is assigned. Finally, the Conditions (C) defines when, where, or how the aim is permitted, obligatory, or forbidden, while the Or else (O) refers to the sanction assigned for not following the rules. As noted by Basurto et al. (2009), the attribute element is often explicit and does not require special analysis. In our study, it consistently refers to the members of a cooperative. We therefore excluded this element from our analysis and proceeded with a simplified “DICO” grammar in order to focus on coding/analysis of the rules themselves. The institutional statements/rules were provided by the cooperatives in our case study (ANAPQUI 2009; ACRA-CC et al. 2014). These rules are communicated to quinoa producers through workshops and production guides. We decided to focus on six production rules that were identified as most important in interviews. The rules are similar for all three cooperatives, but the authors engaged in a reformulation and simplification of the rules for the purpose of this research. Some of the rules correspond to international production standards imposed by labels and monitored by regulatory/certification agencies (such as BOLICERT), while others were independently developed by cooperatives in response to sustainability problems related to quinoa production (rules on llama herding and “barreras vivas”). While not exhaustive, we believe our analysis covers most of the crucial production rules followed by cooperative members in the region. Finally, we were also interested in whether or to what extent these production rules are enforced and respected by individual producers. The question of compliance is central in the literature on the commons, but has (surprisingly) not been studied as much as other aspects of the IAD framework (Siddiki et al. 2012). Producer compliance was evaluated through quantitative data collected in 2015, in combination with insights from focus group discussions and interviews with more than 60 producers and members of cooperatives, including technicians and other stakeholders (NGOs, government representatives). We assigned compliance scores based on the number of cooperative members following a given rule. All of these scores are best estimates: some rely on quantitative data, while others derive from interviews and focus group discussions. The latter are indicated with an asterisk (*). Quantitative data was collected via a survey conducted to generate baseline data for the FATE project (Feminization, Agrarian Transition and rural Employment),2 which investigates the effect of export-led agriculture on local livelihoods, rural labour markets, and gender relations at the community and household level. A total of 305 households were included in the survey, covering topics such as rural employment and household livelihoods as well as agricultural decisions and changing agricultural practices related to the quinoa boom. Most of the people responding to the survey were members of the cooperatives SOPROQUI (64%) or ARPAIAMT (28%), while 1% of respondents belonged to CECAOT and 7% did not belong to any cooperative. The degree of compliance with the rules presented does not represent nor replace formal compliance assessments conducted by other monitoring agencies. Table 3 presents the six rules for quinoa production at the centre of our analysis. The following section discusses both the impact of these rules and the factors influencing estimated compliance with the rules. Cooperatives’ rules and their enforcement. aInformation on sanctions was derived from formal rules articulated by cooperatives as well as from semi-structured interviews. In some cases, stakeholders suggested that certain rules could be considered weak and/or are not strongly enforced by the cooperatives. We have tried to explain this in the main text of this article, though it goes beyond the formal ADICO grammar system. bInformation on compliance was derived from quantitative survey data collected in the 2013–2014 agricultural cycle (n=305). Information distinguished with an asterisk (*) derives from interviews and is thus estimated. The percentages should be understood as indicative. According to our analysis, rules on organic production were the most readily complied with by cooperative members. These rules are clearly formulated, possess strong deontic elements, and stipulate a clear system of sanctions. Hence, producers have a direct interest in complying with these rules. If they are not met, the quinoa is labelled as “conventional”, which results in a significant loss of income. For example, prices at the end of 2016 were around 700 Bolivianos (approximately USD 100) per quintal (46 kg) for cooperatives belonging to ANAPQUI, compared to just over 300 Bolivianos per quintal for conventional quinoa. Various analyses of the quinoa boom show that the resulting agricultural expansion shifted production from mountainous areas to the plains (Jacobsen 2011; Vieira pak 2012; Winkel et al. 2015). While this spatial shift was directly linked to the mechanization of quinoa production, it had the effect of exposing quinoa to increased harm from pests (Orsag et al. 2013). In these conditions, organic production requires careful attention, investment of time, and regular presence in the fields and in the community. These requirements are considered incompatible with the practices of certain more recent – and less experienced – producers (the residentes) who spend a minimum amount of time in their community (Carimentrand 2008; Vieira pak 2012; Kerssen 2015). The cooperatives came up with several strategies to ensure that cooperative members would not be tempted to use chemicals as a result of major pest invasions. First, they developed incentives and reinforced workshops in local communities in order to enhance people’s know-how regarding preventive measures. Further, the cooperatives engaged in several collective actions at the community level and multiplied controls in the last three years. In 2016, a systematic inspection campaign was carried out on behalf of ANAPQUI; responsible officials of SOPROQUI mentioned in interviews that these campaigns were meant to reduce or eliminate use of chemical pesticides. The impact of these rules on CPR systems appeared relatively minimal; interviews suggested that pesticide contamination was considered less important than other challenges such as the extension of cultivation land and the decline of llama herding in the region. However, these two challenges are at least partly addressed by other production rules. Compliance appeared high with rules limiting the area size eligible for cultivation by a single household. These rules were perceived as having helped control the surge in agricultural land by protecting certain non-cultivated areas and ensuring minimum amounts of fallow land during the quinoa boom. The boom significantly increased pressures on land across the region, and the number of hectares cultivated by each household rose considerably. Results from our survey showed that the average number of hectares cultivated yearly went from 3.77 hectares per household in 2007 to more than 7 hectares per household during the agricultural cycle 2014/2015. At the same time, the number of producers increased in many communities. Of those surveyed who increased the amount of land they cultivated, 31% stated they did so by acquiring additional communal land, while 25% increased their production area by reducing fallow periods. Indeed, the quinoa boom provided strong incentives for quinoa producers to extend their cultivation and ignore community norms, thereby weakening the position of traditional authorities in charge of regulating access to land. Extension of agricultural frontiers appears to have an important impact on socio-ecological systems (Winkel et al. 2016), such that strict rules are crucial regarding the amount of land a household may cultivate. The cooperatives’ rules limiting access to land appear to have benefitted the local CPR system as a whole and not just the production of organic quinoa. At the time of this study, compliance appeared to be low with respect to rules on minimum number of livestock and maintenance of natural barriers to address soil erosion. Two key factors may explain this lack of compliance relative to other rules. Because of the high prices of quinoa and lack of precise limits on cultivable land, producers who maintain natural vegetation barriers are at risk of losing the affected land if neighbours plough it and thus stake a claim on it. Furthermore, the rule on owning a minimum number of llamas is not systematically respected by cooperative members due to lack of clarity and enforcement. Some producers perceive the rule as unfair, especially in cases where cooperative members also engage in off-farm employment outside the community. As a result, the general conditions under which this rule applies remain unclear and cooperatives rarely sanction producers who fail to comply. One reason for this may be that the cooperatives view enforcement of this rule as the responsibility of traditional authorities. Recently, however, cooperatives have begun to foster closer collaboration with traditional authorities to further develop and implement such rules aiming at preservation of socio-ecological systems. In this case, the cooperatives’ show a relatively high level of interaction with the traditional CPR system embodied by traditional authorities, although compliance with the relevant rules could be improved. In previous sections, we argued that the quinoa boom provided strong financial incentives capable of weakening traditional norms and authorities. Interestingly, however, our data suggest that the stronger position of the cooperatives – compared with traditional authorities – actually served to strengthen the local resource governance system as a whole seen from the perspective of sustainability. The integration of cooperatives into global value chains provided an important advantage for local actors who could benefit from improved market access (Carimentrand 2008; Laguna 2011). Indeed, the cooperatives benefited from their direct connection to international buyers, in contrast to newer independent producers who had to sell their goods via intermediaries. On the other hand, the volatile market prices for quinoa had a detrimental effect on compliance with certain cooperative rules. Major price fluctuations between 2010 and 2014 created situations in which conventional quinoa could actually be sold at higher prices than organic quinoa, reducing people’s incentives to respect strict organic production rules. In addition, some producers noted that these peaks encouraged greed among farmers. Barreras vivas (living barriers) and fallow land were often ploughed under to gain extra surface area for quinoa fields. In those years where quinoa prices were at their highest (between 2010 and 2013), some cooperatives struggled to buy the total quinoa output for resale, as their financial reserves were significantly reduced. Uncertainty over the ability of cooperatives to buy all the quinoa harmed both the credibility of the cooperatives and the willingness of certain producers to respect the rules of organic production. Our analysis of cooperatives acting as a regulator of CPR via production rules differs from the usual perspective found in the literature, in which individual institutions are represented as accountable for the exploitation of individual resources. As shown in our analysis, the southern Altiplano is characterized by multiple centres of power and land governance is regulated through diverse types of rules and authorities (Argandoña Espinoza 2016; Winkel et al. 2016). We focused our analysis on cooperative rules, but the efficacy of these rules must be placed in a broader framework that includes possible collaboration with other types of actors. The guiding question of this section is whether the polycentric system and especially the participation of cooperatives may be considered sustainable and institutionally robust. We analysed the rules of the cooperatives and their differential compliance vis-à-vis Ostrom’s eight design principles in order to examine the role of cooperatives in the broader resource governance system, to evaluate their ability to collaborate with and strengthen traditional authorities, and to explore how this might affect the sustainability potentials of local governance as a whole. This evaluation makes it possible to highlight the role of cooperatives in a complex governance system, while also drawing attention to potential limits of this polycentric governance system for the sustainable governance of natural resources. In Table 4 below, we present the empirical situation regarding each of the principles. Application of Ostrom’s eight principles to our case study. 1. Clearly defined boundaries The principle of boundaries presents challenges within our case study, both with regard to the precise boundaries of quinoa fields, which is a major area of contention, and to membership in cooperatives. 2. Congruence between the appropriation and provision rule and local conditions The principle of congruence is not completely respected in our case study because of generality and uniformity of cooperative rules versus the specificity and diversity of local conditions. 3. Collective choice arrangements This condition is completely respected, as all the cooperatives fulfil the major democratic requirements typically associated with sustainable governance of natural resources. Participation in the general assemblies is mandatory (though not necessarily respected by all members) and each cooperative elects a new team of leaders every two years. Thus, every member of the cooperative is eligible to become president or vice president and there is some rotation between the main villages and regions in terms of representation on the board of directors. 4. Monitoring (monitors are present and accountable) This principle generally applies to our case study, but several problems were identified. The monitoring activities appear to be well in place. With respect to SOPROQUI and ARPAIAMT (two regional cooperatives of ANAPQUI), a system of monitoring and sanctions exists that is run by the semi-independent organization PROQUINAT. Technicians are members of this latter institution and thus do not depend directly on the president of the local cooperatives. In addition, all quinoa producers from these cooperatives can potentially be monitored by independent inspection agencies and certifiers. 5. Graduated sanctions This principle applies to our case study, but not for all rules. Table 3 summarizes the different systems of sanctions in place to punish non-compliance with the rules of the cooperatives. One major challenge is that certain violations are not backed up by systematic sanctions. Currently, emphasis is placed on organic and fair trade rules, and less on rules such as llama keeping or land limits. 6. Conflict-resolution mechanisms This principle applies to our case study, but conflicts often extend beyond the circle of cooperative members. Cooperatives provide for various types of conflict-resolution mechanisms and help to resolve conflicts between different members. 7. Minimum recognition of rights to organize There are no factors constraining the self-organization of cooperatives. 8. Nested enterprises Cooperatives are multilevel actors that operate both at the very local level (communities, villages) as well as at the national and international levels via the value chains with which cooperatives are linked. Table 4 presents a summary of the eight principles, and the empirical findings from our case study that apply to each principle. Five principles appear particularly relevant for our case study and will be detailed in the following section. We have chosen to discuss these selected principles in greater depth for two reasons: First, they illustrate the tensions and challenges that can exist in this specific governance system; second, they illustrate interesting opportunities that can arise from the interaction between traditional authorities and cooperatives. The first principle may be divided into two elements: well-defined boundaries of the resource exploited, and well-defined user groups that benefit from the specific resource (Cox et al. 2010). In our case, challenges were evident regarding both of these elements. Resource boundaries were often unclear and lack of precise boundaries between farmers’ quinoa fields was identified as a source of conflict within communities (Vieira pak 2012). Further, in many cases, the user groups benefiting from resources were also unclear. Membership in cooperatives is not universal; in many communities, the absence of broad membership restricts the ability of cooperatives to set rules that affect socio-ecological systems as a whole. Other community members’ access to land and cultivation of quinoa can vary significantly from year to year, and the quinoa boom resulted in significant in-migration into small communities (Kerssen 2015), further blurring the boundaries between land users. Finally, in many cases, one could argue that membership in a cooperative need not contradict maintaining a formal role in traditional authorities. Hence, land users could participate in and respect both governance systems – cooperative and traditional – and there is scope for greater collaboration between the two regarding the principle of clear boundaries. At the same time, the suitability of this principle has been debated in the literature on governance of socio-ecological systems. Several authors argue that the principle of boundaries might not be needed to guarantee sustainable management of socio-ecological systems (see, for example, Turner 1999; Agrawal 2001; Blaikie 2006). Often, the concept of boundaries does not apply to specific groups of users, such as pastoralist groups or communities that have undefined or fluctuating membership. Lack of universal membership echoes reflections on community homogeneity that is sometimes regarded as an artefact in the literature (Agrawal and Gibson 1999). Hence, lack of universal membership in cooperatives might not represent a major problem. Indeed, we follow Quinn et al. (2007) in arguing that the lack of clear boundaries has not necessarily resulted in weak management of natural resources in our case study. Similar to the boundary principle, the principle of congruence is often split into two distinct parts: a) congruence between local conditions and rules, and b) congruence with local conditions (Ostrom 1990; Cox et al. 2010; McGinnis 2011). Nevertheless, neither of these distinct views of congruence fully applies to resource governance by cooperatives. While cooperative rules can help to reduce pressure on land, the motivations behind them largely reflect the aim of capturing additional benefits from the quinoa value chain by means of internationally recognized fair trade certifications (see Laguna 2003). Our interviews indicated that the rules were not developed to ensure the sustainable use of natural resources (e.g. land) per se. Further, the rules were developed at the national and/or subnational level, and, as such, do not precisely reflect the specific local conditions of natural resource use in each community. The relevant communities are characterized by a wide range of socio-ecological conditions including diverse soil types, land types (hills or plains), and quantities of land available per producer. A strict rule such as 10 hectares of cultivated land per producer has very little relevance in communities already characterized by high degrees of pressure on land. Nevertheless, our results suggest that cooperatives’ rules and the interaction between cooperatives and traditional CPR institutions contributed to better management of community land and natural resources when they were associated with strong community norms. Further, there appeared to be fewer conflicts over land limits in villages and communities with higher levels of membership in cooperatives. Notably, traditional community authorities in cooperative areas also appeared to be more aware of local requirements and more likely to request that community members cultivate specific zones each year. Problems of congruence between cooperative rules and local conditions might be less important than we would assume based on Ostrom’s model. It may be better to consider cooperative and traditional governance systems as complementary, not mutually exclusive or competing. High degrees of participation in assemblies and workshops among quinoa farmers appeared to be linked to specific requirements placed on producers wishing to remain part of cooperatives. Regular meetings can greatly enhance the proper management of natural resources in several indirect ways. Through the meetings, quinoa producers were exposed to discourses on natural resource management, and awareness was raised about potential risks. Further, the meetings increased people’s capacity to mitigate risks, and built trust and healthy communication between producers, managers, and technicians from the cooperatives as well as between producers themselves. Trust has been shown to be a key element that contributes to overcoming prisoner-dilemma type situations. Communication is another central element that contributes to safeguarding CPRs (see, for instance, Ostrom et al. 1994; Adams et al. 2003; Cardenas et al. 2004; Laerhoven 2010). Finally, we note that the cooperative SOPROQUI invested significant time and energy in the organization of regular meetings between its members and the management. Cooperatives offer various types of conflict-resolution mechanisms. They help resolve conflicts between their members, and they often work together with traditional authorities in the event of conflicts between cooperative members and non-members. Both systems must contend with a high number of conflicts in the region. In our survey, 35% of 305 households said they were involved in a land use conflict currently or in recent years, a phenomenon that appears to have increased during the quinoa boom. Many of the conflicts involved community members who recently returned and sought to benefit from the boom. These returns are evidenced by the 2002 and 2012 censuses, which reveal significant population increases in rural communities over this period (INE 2012). This has led some researchers to posit the possibility of “re-peasantization” among rural communities in the area (Kerssen 2015; see also van der Ploeg 2014). However, most of these new residents pursue one or more professional activities in urban centres in addition to producing quinoa (Winkel et al. 2015). Their lack of participation in community assemblies and their tendency to convert community land to quinoa fields attracted criticism from other community members. Recent work on the development of community norms has sought to reduce conflicts and mitigate the consequences of the quinoa boom. Many of these norms have been developed jointly by community authorities and NGOs (Felix 2008). Enforcement of these community norms, however, is seen as a challenge (Argandoña Espinoza 2016; Winkel et al. 2016). Community members often harshly judge the ability of traditional authorities to enforce community norms effectively. Several reasons may explain their lack of effectiveness. First, community norms are not necessarily backed up by state laws. Thus, it is not possible to appeal to anyone outside the community to enforce them. Second, in the absence of external legal jurisdiction, rule enforcement depends exclusively on the actions and abilities of those individuals who assume the cargos (position) with respect to rules enforcement. These abilities vary significantly from one person to another, making rule enforcement appear quite arbitrary. Finally, in settings where many community members bear ties of family or friendship, the impartiality of community authorities is often questioned by those charged with violating norms. Our survey also revealed a relatively high percentage of distrust among community members towards traditional authorities. Only 51% of respondents said they trusted local authorities (see Figure 3). However, this finding should be kept in perspective: in this rural context, people generally display distrust towards various authorities including state institutions. Indeed, almost two-thirds of the producers interviewed expressed distrust towards the municipal government and the central government. Approximately 55% of respondents voiced trust of farmer cooperatives, the highest score. Nevertheless, it remains puzzling why trust would generally be this low in all of these institutions/authorities. It may be a result of these institutions inability to enforce certain norms – but more research would be needed to develop this understanding further. Overall, the complementarity between traditional authorities and productive organizations embodied by cooperatives remains important, and it might explain the high level of participation of cooperatives in institution-building processes. Levels of trust of household heads towards various authorities in our study region. In the present article, we conceptualized cooperatives as a local institution that established a set of rules before and during the quinoa boom. In this way, cooperatives may be considered part of a broader polycentric system of institutions that function well and serve to connect local producers with international buyers, while collaborating with traditional authorities. The established rules reflect both requirements of international buyers and, to a lesser extent, the local conditions of the resource setting. The question arises as to whether the development of cooperatives and their rules are an example of bottom-up institution-building consistent with the concept of constitutionality (Haller et al. 2015). Despite being market-driven, the cooperatives indeed match the criteria identified by Haller et al. (2015), as seen in Table 5. The cooperatives in our study represent empowered actors that have established rules according to their own perspective, albeit with support from external actors. Indeed, the first cooperatives were built with the support of NGOs, and there has been important technical cooperation between the most important Bolivian cooperatives and several international actors over the years (Carimentrand et al. 2014). The Bolivian state has not been very present in the region historically (Laguna 2011). Components of constitutionality identified by Haller et al. (2015). Outside catalysing agents (fair platform) Condition fulfilled. International NGOs had important influence on the development of certain cooperatives, including CECAOT. Although relatively absent from the study area, the current participation of the Bolivian state in programmes that support the role of cooperatives (including through the development of a denomination of origin label) is encouraging and has created a fair platform for the consolidation of local institutions. In addition, the recent consequences of price fluctuations highlight the role of power struggles within the constitutionality process (Haller et al. 2015). Indeed, the quinoa boom demonstrated how price fluctuations could redefine the position of traditional authorities and cooperatives. Traditional authorities appeared to be weakened as a result of their inability to address price-related challenges, although the trajectories in different communities were very diverse. Overall, our interviews suggest that the price fluctuations, while creating a “generalized chaos”, ultimately reinforced certain local CPR institutions. In many communities, cooperatives helped to fill gaps left unaddressed by traditional authorities. New strategies, monitoring, and sanction systems were developed to negotiate changing price incentives. As such, this case study presents a good example of institutional change and bottom-up institution-building processes. In this article, we showed that in a context characterized by general uncertainty over community prerogatives and land boundaries settings as well as lack of enforceable sanctions for certain types of rules, farmer cooperatives played an important role in establishing rules to reduce pressures on natural resources. Our analysis of cooperatives acting as a regulator of CPR via production rules differs from a conventional perspective in which a single institution is represented as accountable for the exploitation of a specific resource. Farmer cooperatives are multilevel actors both at the local level (communities, villages) as well as at national and international levels via the value chains in which they operate. At the local level, cooperatives are just one – albeit important – element of a complex polycentric resource governance, and their role cannot be understood without accounting for other actors in the system. They benefit from the complementary support of strong community authorities, with clear legal recognition, which are capable of resolving conflicts in their own communities. Our analysis of cooperatives in a particular CPR governance through the lens of Ostrom’s eight design principles hence highlights the importance of complementarity between two different types of institutions. At the same time, cooperatives face challenges including (in)congruence with some local resources. The potential of some rules is not completely fulfilled, as evidenced by the low compliance rates with certain rules (such as “barreras vivas”). As one out of many institutional actors participating in a complex resource-governance system, farmer cooperatives contribute to sustainable resource management without completely replacing functions of traditional authorities. In our case study, cooperatives reduced some of the negative consequences of the quinoa boom, a period when traditional authorities were acutely challenged by high levels of pressure on land resources. Our research framed cooperatives as part of a polycentric system. While the sustainability of agricultural production is presented as a challenge in many contexts, the potential of cooperatives has to be recognized, including by policy-makers. In particular, the opportunity of the collaboration between cooperatives, traditional authorities with a small degree of involvement of the central state could potentially be further explored and might present important opportunities for decentralised natural resource governance. This kind of collaboration offers interesting examples of potential avenues for future research, but also to some degree for policy makers. As such, the involvement of all these actors in efforts towards the development of a geographic label of origin for quinoa from the southern Altiplano indicates that the Bolivian State recognizes cooperatives as important partners. Further, the inclusion of cooperatives in the label negotiation processes, alongside municipal authorities and private companies, suggests that the Bolivian state not only acknowledges the legitimacy of polycentric governance, but actively builds on it. This recognition bodes well for further developing the cooperation between different actors of a complex governance system. Against the background of the dynamics in quinoa – the former boom and subsequent bust – and their critical consequences, political strategies to incentivise and fine-tune the cooperation between these different institutions need to be forged. 1Three organizations were used as a case study in this paper. While two of these organizations (SOPROQUI and ARPAIAMT) have the legal status of association and are members of the National Association of Quinoa Producers (ANAPQUI), the third one defines itself as an umbrella organization of several local cooperatives (CECAOT). For the sake of simplicity, we use the term “cooperative” for all the three organizations examined in this study. 2FATE is a six-year research project funded by the Swiss National Science Foundation and the Swiss Agency for Development and Cooperation. This research was founded by the Swiss national Foundation. ACRA-CC, ARPAIAMT, and SOPROQUI. Manual de Buenas Practicas Agricolas de Produccion de Quinua Orgánica. Uyuni. Adams, W. M, Brockington, D, Dyson, J and Vira, B (2003). Managing Tragedies: Understanding Conflict over Common Pool Resources. Science 302(5652): 1915–1916. Agrawal, A (2001). Common Property Institutions and Sustainable Governance of Resources. World Development 29(10): 1649–1672. Agrawal, A and Gibson, C. C (1999). Enchantment and Disenchantment: The Role of Community in Natural Resource Conservation. World Development 27(4): 629–649. ANAPQUI. Normas Básicas para una Producción Sostenible de la Quinua Real del Altiplano Sur de Bolivia. La Paz, Bolivia: Asociación Nacional de Productores de Quinua. Argandoña Espinoza, J (2016). Normas Comunales y Sustentabilidad de la Producción de Quinua: Estudio de Caso: Municipio de Llica, Provincia Daniel Campos del Departamento de Potosí. MA Thesis, CIDES UMSA, La Paz. Basurto, X, Kingsley, G, McQueen, K, Smith, M and Weible, C. M (2009). A Systematic Approach to Institutional Analysis: Applying Crawford and Ostrom’s Grammar. Political Research Quarterly 63(3): 523–537. Bazile, D, Jacobsen, S.-E and Verniau, A (2016). The Global Expansion of Quinoa: Trends and Limits. Frontiers in Plant Science 7: 622. Berkes, F (2008). Commons in a Multi-Level World. International Journal of the Commons 2(1): 1–6. Blaikie, P (2006). Is Small Really Beautiful? Community-Based Natural Resource Management in Malawi and Botswana. World Development 34(11): 1942–1957. Cardenas, J.-C, Ahn, T. K and Ostrom, E (2004). Communication and Co-Operation in a Common-Pool Resource Dilemma: A Field Experiment. Advances in Understanding Strategic Behavior: Game Theory, Experiments, and Bounded Rationality. Huck, S ed. : 258–286. New York: Palgrave. Carimentrand, A (2008). Les Enjeux de la Certification Biologique et Équitable du Quinoa (Chenopodium Quinoa Willd.) Du Consommateur au Producteur. PhD Thesis: Montpellier. Carimentrand, A, Baudoin, A, Lacroix, P, Bazile, D and Chia, E (2014). Las Dinamicas de Comercializacion de la Quinua en los Paises Andinos. Estado del Arte de la Quinua en el Mundo en 2013. 394.408Rome: FAO. Chatterjee, P. (2008). Peasant Cultures of the Twenty-First Century. Inter-Asia Cultural Studies 9(1): 116–126. Cox, M (2011). Advancing the Diagnostic Analysis of Environmental Problems. International Journal of the Commons 5(2): 346–363. Crawford, S. E. S and Ostrom, E (1995). A Grammar of Institutions. American Political Science Review 89(3): 582–600. Dietz, T, Ostrom, E and Stern, P. C (2003). Struggle to Govern the Commons. Science 302(5652): 1907–1912. Ensminger, J (1996). Making a Market: The Institutional Transformation of an African Society. New York: Cambridge University Press. https://doi.org/10.2307/294476. Fairbairn, B (2003). Three Strategic Concepts for the Guidance of Co-Operatives: Linkage, Transparency, and Cognition. Saskatoon: Centre for the Study of Co-operatives. Felix, D (2008). Culture Durable du Quinoa en Bolivie: Pratiques Individuelles et Règles Communautaires. La Paz: Ruralter. Forsyth, T and Johnson, C (2014). Elinor Ostrom’s Legacy: Governing the Commons and the Rational Choice Controversy. Development and Change 45(5): 1093–1110. Frantz, C, Purvis, M. K, Nowostawski, M and Savarimuthu, B. T (2013). Boella, G., Elkind, E., Savarimuthu, B.T.R., Dignum, F. and Purvis, M.K. eds. nADICO: A Nested Grammar of Institutions. PRIMA 2013: Principles and Practice of Multi-Agent Systems. PRIMA 2013. 8291Berlin and Heidelberg: Springer. Geerts, S, Raes, D, Garcia, M, Del Castillo, C and Buytaert, W (2006). Agro-Climatic Suitability Mapping for Crop Production in the Bolivian Altiplano: A Case Study for Quinoa. Agricultural and Forest Meteorology 139(3–4): 399–412. Haller, T (2007). Understanding Institution and Their Links to Resource Management from the Perspective of New Institutionalism. Bern: NCCR North-South Dialogue. (no. 2) https://doi.org/10.7892/boris.52831. Haller, T and Merten, S (2008). ‘We Are Zambians – Don’t Tell Us How to fish!’ Institutional Change, Power Relations and Conflicts in the Kafue Flats Fisheries in Zambia. Human Ecology 36(5): 699–715. Haller, T, Acciaioli, G and Rist, S (2015). Constitutionality: Conditions for Crafting Local Ownership of Institution-Building Processes. Society & Natural Resources 29(1): 68–87. Harriss, J. (1982). Rural development: Theories of Peasant Economy and Agrarian Change. London : Hutchinson University Library. INE. Bolivia. Características de Población y Vivienda. Censo Nacional de Población y Vivienda 2012. La Paz. http://www.ine.gob.bo/. Jacobsen, S.-E (2011). The Situation for Quinoa and Its Production in Southern Bolivia: From Economic Success to Environmental Disaster. Journal of Agronomy and Crop Science 197(5): 390–399. Kerssen, T. M (2015). Food Sovereignty and the Quinoa Boom: Challenges to Sustainable Re-Peasantisation in the Southern Altiplano of Bolivia. Third World Quarterly 36(3): 489–507. Knight, J (1992). Institutions and Social Conflict. Cambridge: Cambridge University Press. https://doi.org/10.1017/CBO9780511528170. Laerhoven, F. V (2010). Governing Community Forests and the Challenge of Solving Two-Level Collective Action dilemmas – A Large-N Perspective. Global Environmental Change 20(3): 539–546. Laguna, P (2000). El Impacto del Desarrollo del Mercado de la Quinua en los Sistemas Productivos y Modos de Vida del Altiplano Sur Bolivano. La Paz. Laguna, P (2011). Mallas y Flujos: Acción Colectiva, Cambio Social, Quinua y Desarrollo Regional Indígena en los Andes Bolivianos. Wageningen: Wageningen University. doi:ISBN 978-90-8585-960-4. Landolt, G and Haller, T (2015). Alpine Common Property Institutions under Change: Conditions for Successful and Unsuccessful Collective Action by Alpine Farmers in the Canton of Grisons, Switzerland. Human Organization 74(1): 100–111. Nuñez de Arco, S (2015). Quinoa’s Calling. Quinoa Improvement and Sustainable Production. Murphy, K. M and Matanguihan, J eds. Wley. : 211–226. Hoboken, New Jersey: Wiley. Orsag, V, León, L, Pacosaca, O and Castro, E (2013). Evaluación de la Fertilidad de los Suelos Para la Producción Sostenible de Quinua. Tinkazos 16(33): 89–112. Ostrom, E (1990). Governing the Commons: The Evolution of Institutions for Collective Action. Cambridge: Cambridge University Press. https://doi.org/10.1017/CBO9780511807763. Ostrom, E (2009). Understanding Institutional Diversity. Princeton: Princeton University Press. Ostrom, E (2010). Beyond Markets and States: Polycentric Governance of Complex Economic Systems. Transnational Corporations Review 2(2): 1–12. Ostrom, E, Gardner, R and Walker, J (1994). Rules, Games, and Common-Pool Resource Problems. Rules, Games, and Common-Pool Resources, 10.2307/2083092. Polski, M. M and Ostrom, E (1999). An Institutional Framework for Policy Analysis and Design. Workshop in Political Theory and Policy Analysis Working Paper W98-27. Bloomington, IN: Indiana University. Pouteau, R, Rambal, S, Ratte, J. P, Goge, F, Joffre, R and Winkel, T (2011). Downscaling MODIS-Derived Maps Using GIS and Boosted Regression Trees: The Case of Frost Occurrence over the Arid Andean Highlands of Bolivia. Remote Sensing of Environment 115(1): 117–129. Schlüter, A and Theesfeld, I (2010). The Grammar of Institutions: The Challenge of Distinguishing between Strategies, Norms, and Rules. Rationality and Society 22(4): 445–475. Siddiki, S, Weible, C. M, Basurto, X and Calanni, J (2011). Dissecting Policy Designs: An Application of the Institutional Grammar Tool. Policy Studies Journal 39(1): 79–103. Siddiki, S, Basurto, X and Weible, C. M (2012). Using the Institutional Grammar Tool to Understand Regulatory Compliance: The Case of Colorado Aquaculture. Regulation & Governance 6(2): 167–188. Tschopp, M (2018). The Quinoa Boom and the Commoditisation Debate: Critical Reflections on the Re-Emergence of a Peasantry in the Southern Altiplano. Alternautas, Published online. Turner, M. D (1999). Conflict, Environmental Change, and Social Institutions in Dryland Africa: Limitations of the Community Resource Management Approach. Society & Natural Resources 12(7): 643–657. van der Ploeg, J. D (2008). The New Peasantries. Oxon: Earthscan. van der Ploeg, J. D (2014). Peasant-Driven Agricultural Growth and Food Sovereignty. Food Sovereignty: A Critical Dialogue 41(6): 1–32. Vassas Toral, A (2011). Ruralité et Agriculture au Prisme des Mobilités Spatiales. L’Altiplano Sud de la Bolivie À l’heure du Boom de la Quinoa. Université Paul Valéry – Montpellier III. http://tel.archives-ouvertes.fr/tel-00668162. Vassas-Toral, A and Pak, M. V (2010). La Production de Quinoa dans l’Altiplano Sud de la Bolivie: Entre Crises et Innovations. ISDA 2010. : 12.Paris: Cirad-Inra-SupAgro. Vieira pak, M (2012). Le Boom de la Quinoa Dans l’Altiplano Sud de la Bolivie: Bouleversement du Système Agraire, Discours et Tensions Socio-environnementales. PhD Thesis. Paris: AgroParisTech. Walsh-Dilley, M (2013). Negotiating Hybridity in Highland Bolivia: Indigenous Moral Economy and the Expanding Market for Quinoa. Journal of Peasant Studies 40(4): 659–682. Wilson, D. S, Ostrom, E and Cox, M. E (2013). Generalizing the Core Design Principles for the Efficacy of Groups. Journal of Economic Behavior & Organization 90: S21–S32. Winkel, T, Bertero, H. D, Bommel, P, Bourliaud, J, Chevarría-Lazo, M, Cortes, G, Gasselin, P, Geerts, S, Joffre, R, Léger, F, Martinez Avisa, B, Rambal, S, Rivière, G, Tichit, M, Tourrand, J. F, Vassas Toral, A, Vacher, J. J and Vieira Pak, M (2012). The Sustainability of Quinoa Production in Southern Bolivia: From Misrepresentations to Questionable Solutions. Comments on Jacobsen (2011, J. Agron. Crop Sci. 197: 390–399. Journal of Agronomy and Crop Science 198(4): 314–319. Winkel, T, Álvarez-Flores, R, Bertero, D, Cruz, P, del Castillo, C, Joffre, R, Parada, S. P and Tonacca, L. S (2014). Calling for a Reappraisal of the Impact of Quinoa Expansion on Agricultural Sustainability in the Andean Highlands. Idesia (Arica) 32(4): 95–100. Winkel, T., Álvarez-Flores, R., Bommel, P., Bourliaud, J., Chevarría Lazo, M., Cortes, G., Del Castillo, C., Gasselin, P., Joffre, R., Léger, F., Nina Laura, J. P., Rambal, S., Rivière, G., Tourrand, J., Vassas-Toral, A. and Vieira Pak, M. (2015). The Southern Altiplano of Bolivia. State of the Art Report on Quinoa Around the World in 2013. : 362–77. Chile: FAO/Cirad Santiago. Winkel, T, Bommel, P, Chevarría-Lazo, M, Cortes, G, Del Castillo, C, Gasselin, P, Léger, F, Nina-Laura, J.-P, Rambal, S, Tichit, M, Tourrand, J.-F, Vacherk, J.-J, Vassas-Toral, A, Vieira-Pak, M and Joffre, R (2016). Panarchy of an Indigenous Agroecosystem in the Globalized Market: The Quinoa Production in the Bolivian Altiplano. Global Environmental Change 39: 195–204.